iTunes has introduced a new feature called, PING. iTunes Ping is a social network within iTunes that allows people to follow their favorite people, artists, bands and singers. When you "FOLLOW" a band, you will be shown updates, news, and posts on your very own Ping page. iTunes Ping also lets you "like" or "post" a song from your own music library! Have Fun Teaching has fun songs for kids including Songs for Kids, Counting Songs, Character Education Songs, Fitness Songs and Alphabet Songs. 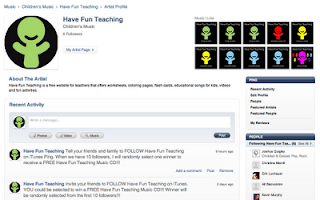 Check out the Have Fun Teaching Ping Page Today! its nice post.thanx for this informative post.